Whew it was a windy and brisk morning this morning. It feels like fall out here, but it’s nice. 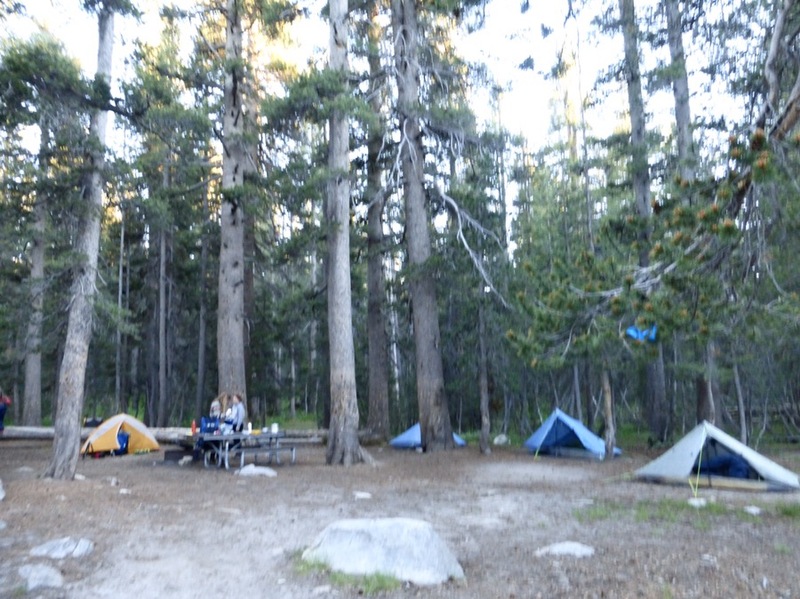 We still got our early start, and we were at the Tuolumne Meadows high Sierra Camp by 8am for breakfast. 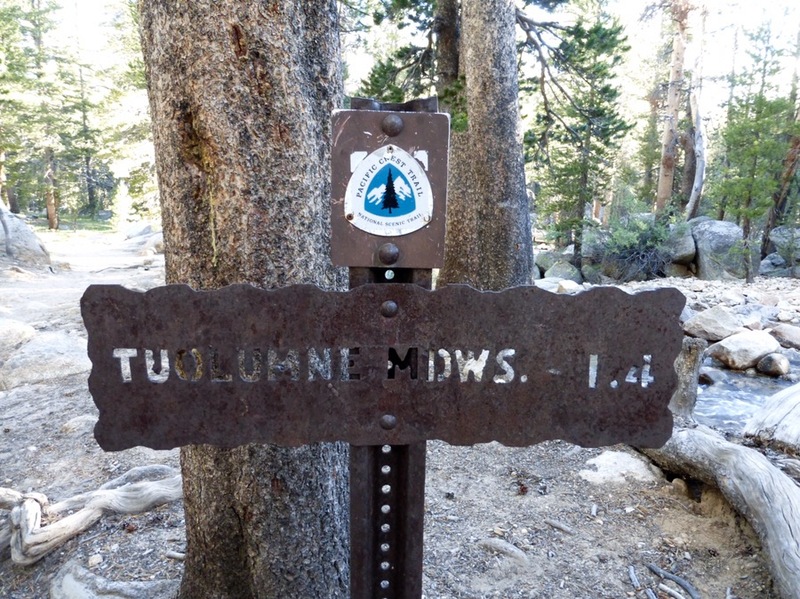 Nice morning walking to Tuolumne Meadows. 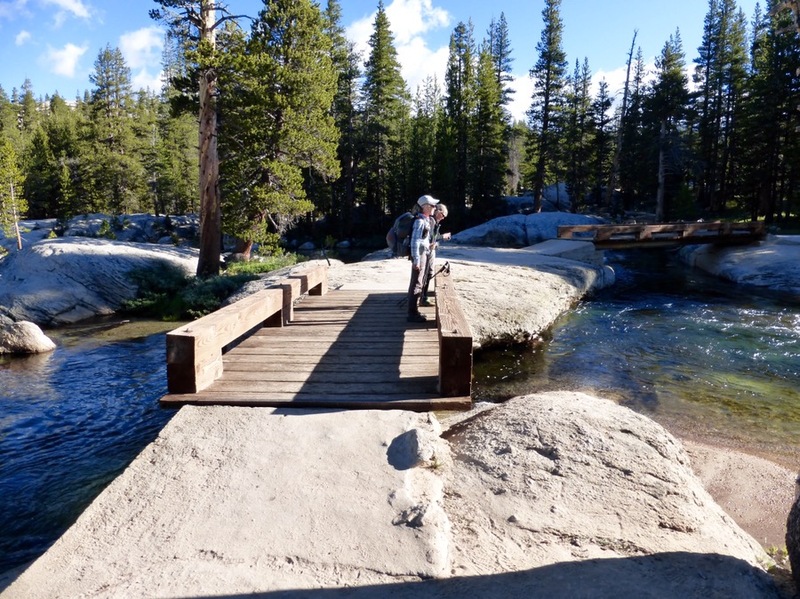 We are pretty sure that my year on the PCT that the water was up to these bridges. I’m still not feeling great from my period, and I don’t like spending much money on food, (especially when I’m not very hungry) so Rockin’ and Why Not had breakfast at the restaurant of the high Sierra camp while I finished some blog stuff. I was even able to get a phone call out to my sister, but not internet. 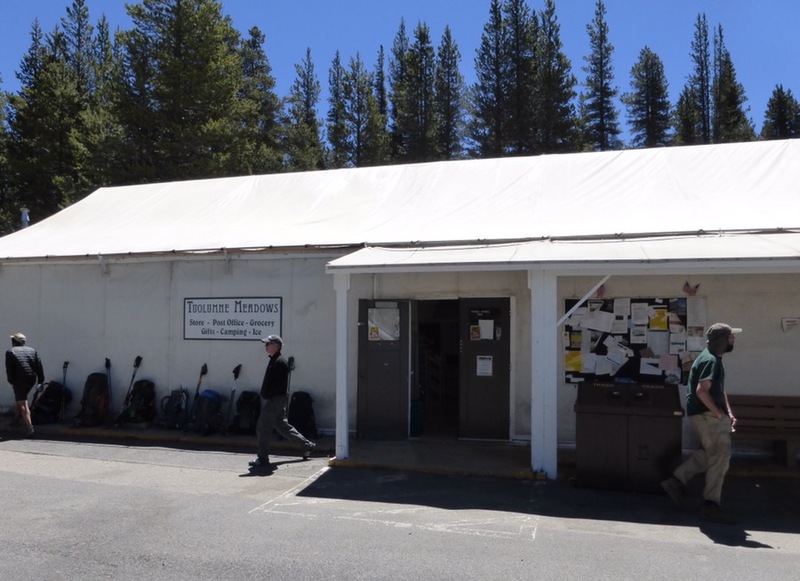 Then we headed over to the Tuolumne Meadows store to pick-up our resupply boxes and anything else we needed for today and the final three days. I have to give the store credit, they have a great selection that is very affordable. There is an attached Post Office and the employees kindly got our boxes for us on a Sunday. 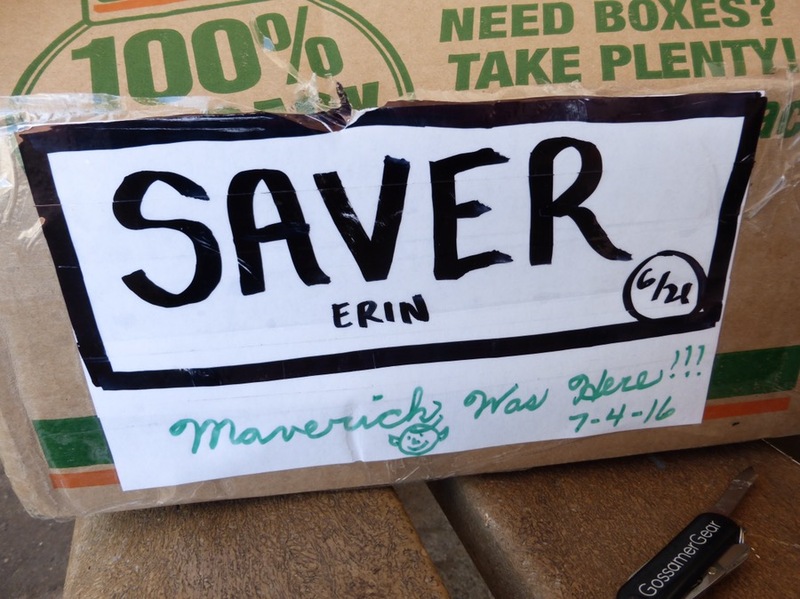 My friend Maverick, who is section hiking the PCT, left me a message on my resupply box, which was a fun surprise. Hi Maverick! A note from my friend Maverick! The store even has a charging station for devices. I find it pretty cool that there are still places where people will plug in a phone or camera and walk away while it charges in a public store. Props to the Tuolumne Store! With the extended stops we’ve been making, I’ve tried to limit the costs here and in the last town of Mammoth by not eating out so much and making myself eat what I have. I understand the appeal for Rockin’ and Why Not to do this stuff and the need for rest, but I have 9 months of travel ahead, and I can only afford to do that much travel because I do watch my spending and work hard to limit my town time. Today, I had a bar for breakfast, a microwave burrito with chocolate milk for lunch, and a cheap cheeseburger for dinner, which saved a good deal compared to the more formal dining options. The $6 camping fee is tough to swallow, but is totally understandable. It’s just tough to swallow cause we could have hiked out and had a nice remote place to ourselves for free. Still, I need to respect the appeal of nice meals, rest, and a shower. I think it’s mostly because we are just three days away from finishing and we just took a long nero and zero in Mammoth that I’m more antsy. Also, I’m worried that this now may push us out of the range of available dates our friend LoveNote (PCT 2011, CDT 2013) had to see us. She and Burly (also CDT 2013) recently had their first baby and I really was looking forward to seeing the baby for the first time, and I hope that still will happen. There are some camping restrictions coming up and we may now have thrown things out of whack for that as well and might be forced into a shorter day tomorrow to comply. We will see. At least weather isn’t an issue. In the end, it doesn’t change the summer timeframe much. I just have this internal balance of work vs play that I feel is now in imbalance. Not that this isn’t nice, but these days/hours add up over time. I like to have a time buffer for weather, unexpected things, and truly needed rest days, but the buffer is shrinking and this is just the first hike of the summer. 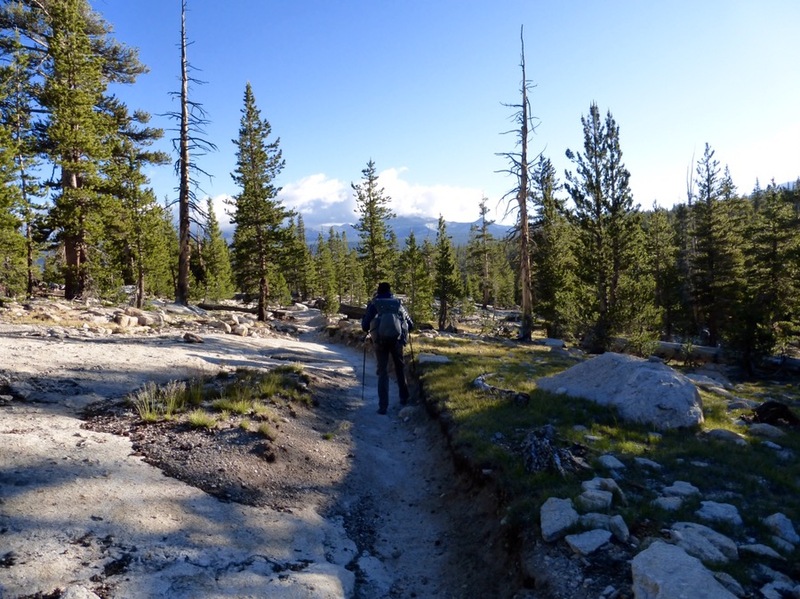 I don’t want to get 3wks from now and realize I don’t have time to do the hikes I’d like this summer, but that is my mind-racing “wired” side that I can’t seem to turn off and I need to work on internalizing that for the sake of my hiking partners. I need to chillax about it and enjoy a day to watch shows. Speaking of shows, I got some great binge watching in today! I seriously had like 7hrs of downtime! I had my solo time at the campground for the day and caved it up watching the 3 episodes of Orange Is The New Black that I had on my phone and the first four episodes of season one of UnReal. I was quite content and entertained by both. This season of OITNB started off bumpy, but it was hitting a stride right when I ran out of episodes I had available offline, ah! Now I’m going through UnReal and am getting hooked. I’m late to jump on the bandwagon on that one and am enjoying it. Yes, it’s totally fluff and mindless, but hey, I’m enjoying it! So, now the backpacker camp has filled up with tons of PCTers, JMTers, and other backpackers doing various trips. I’m wide awake and wondering how I’ll sleep. We are on the periphery of the sites, but there is still plenty of movement and noise, so this will be interesting…good thing I have shows to watch, haha! Back to hiking tomorrow. Appreciate the point of view and honesty. I have wondered lately how my lack of town stops, eating cheap and hiking on for free backcountry sites will play into the social aspects of my thru. I am going on this hike to be outside, see things and I enjoy being alone. But I know there is a wonderful community of hikers and wonder how that will balance out with my frugal and introverted personality. I also have a small measure of guilt associated with the time and cost of my thru because I will be leaving my family to do something just for me. When you have spent years thinking of yourself as a financial unit of 4, it is a little hard to take such a large amount of money and spend it just on yourself! Yep, I for sure have that internal balance constantly pulling me. It’s unique for each person out there where their balance is struck with it all. I hope so! I’m sitting here looking at Visa stuff for a couple months from now and would love for that to just go through so I can can stop worrying about it! That note on your box is so cool! Always neat to connect in an unusual way.